To change your car’s oil, start by putting the oil drain pan and tools within easy reach. Open the bonnet, pull out the dipstick and take off the oil cap. Get under your car. If there’s a plastic cover beneath the engine, take it off. Then locate the oil sump - directly beneath the engine. Place the drain pan so it’s underneath the sump plug. Undo the sump plug with a spanner and let the oil drain out into your pan. Locate the oil filter - a round canister that will be screwed against the engine, about 4 inches deep. Unscrew it and replace with a new one, smearing fresh oil around the rubber seal before re-attaching. 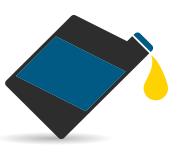 To finish, check the oil is fully drained, clean the sump plug with a rag, re-attach the sump plug and plastic cover and fill your car with fresh oil (make sure you check the dipstick for oil level). Take the old oil to your local recycling center - do NOT pour it down the drain! Check your Oils aren’t bald and are the right pressure as we are approaching winter and you want to ensure you have the right level of grip.